I’ve been told that today (Friday the 14th!!!!) is “Guilt-trip Your Lurkers Day”. I know you’re out there. Because although the usual cast of criminals comments pretty regularly here (and owing to which they are all invited over to my house the next time I make a ham), their numbers are dwarfed by that of you, the silent-but-violent majority. I don’t want you to just say “hi”, though. If you’re a lurker (someone who hasn’t left a comment, say, in more than 3 months or fewer than 3 times last year) I want you to help me out. Since you are provided all of this fabulous content for free (and I know you wanted to pay me for that post I wrote about Twitter Lists), and I don’t run ads, and you don’t leave comments, our relationship is a bit one-sided. So, in payment I require of you, Dear Lurkers, some blog prompts. What would you, the audience, like me to write about? You can also say “hi”. But I prefer blog prompts. Or you can pay me cash and we’ll speak no more about this “lurker” nonsense. The pressure! Hi! Wait, you need more? As the kids gets older what are you doing for daddy time outside of the backpack? Lordy, I hope this is right! 3 times or within 3 months? That’s a lot of math. I mostly want you to do my math for me. 3 times or within 3 months? That's a lot of math. I mostly want you to do my math for me. As someone who is not yet a mum, but is hoping to be in about 18 months time, what are the most exciting things you have discovered since becoming a dad? Well HI!! I snuck on over from RazingMayhem.com I am not a frequent lurker, but I'm here so I can't leave without leaving a message. I have to delurk AND think of a blog prompt too?! Too much pressure! That being said, what's the last thing that put you under pressure? Was it funny? I hope so, because sad things make me sad. That being said, what’s the last thing that put you under pressure? Was it funny? I hope so, because sad things make me sad. I'd like to hear about your detailed hair care regimen. I'd settle for more recipes. Finally delurking… I like when you mercilessly bitchslap people/trends/cultural phenomena using the power of philosophy and watertight reasoning. Especially when it makes me giggle. More of the same, please. Yeah I've lurked for a while… I'm 25 and don't have kids but I do love them. Prompts. Hmm. I got nothing. What are you planning to do about school for the kids as they get older- public, private, etc? I don't lurk… I stalk. You can thank me later. Do you want more children? I have a son and daughter myself (though son born first) and although my life already seems hectic enough with swimming lessons, soccer and school (my kids are 5 & 2) and my husband and I feel like we are done having kids…. I do feel a bit sad that my daughter doesn't have a sister too, and that my son doesn't also have a brother. Not sure I count as a lurker since I just found this place earlier this week. But I'll shout out a little hello anyway. I read via google reader. I have left a comment or two. I didn't realize there was going to be a test, or I might have studied. Probably not though. I have a hard enough time trying to think of things to blog about at me own place, so really? Whatever you write I'll read. And maybe comment on. You know how Oprah has those very special episodes about her favorite things? I want you to write about your favorite things, like raindrops on roses and whiskers on kittens. I actually thought your Twitter lists post was great! I'm so guilty. I read, I laugh…i go about my business without leaving a comment. And then i curse when other people do that to me. There are words for people like me…hmmm…what are they again? Hmm…things to blog about. I dunno. I seem to mainly blog about my kids poop. Not the most interesting topic…but I just can't stop. Madness ensues. You should try it. I can't even think of things to right about on my *own* blog lately, so I got nothin' on the prompt front. Oh, wait, there you go: Write (again) about writer's block. Go. Paid in Full. I probably haven't commented three times in the last three years, I guess that makes me a lurker. Not a chance I can give you a writing prompt, if I could do that I'd write on my own blog! Dear Daddy Blogger, You are funny hahaha! Please consider linking to my awesome blog. Okay sorry, I couldn't think of anything else. I come here or the funny and for the pictures of your gorgeous kids. Does that sound creepy? This is why I don't comment. Well crap, I'm out of cash. I guess that means a prompt huh? Ok, what're your favorite non-backpacking things to do w kids? I guess I lurk. I figure mostly that I followed you on Twitter because a friend who knew you from high school also followed you. And that's a pretty tenuous claim to commenting. I want to know more about Adrian. Classic second kid syndrome… how's he different? What are you doing differently (better? worse?) as a parent the second time around. I'm highly anticipating the rest of the post that ends 'Backpacking Dad 1. Wal-Mart cart return 0'! I'd like you to blog about how I ALSO waited in line 45 minutes to see Rapunzel. It was not a DAD win, it was a PARENTING win. Delurking….Hi! I have no prompts…I tried to start a blog at some point and couldn't figure out what to say. If I don't know what to say myself, I certainly don't know what to suggest for others! Although, I do enjoy hearing about the random excursions you take with the kids. I lurk. Well, I've commented maybe twice, ever. I've been reading for a long time, long enough I can't recall when I started. Um, as for a prompt, I am always happy to hear more about your Buffy fandom. Good stuff. Well I've tried to comment before but keep having technical difficulties doing so. So I took that as a sign that your blog has a mind of its own and will not accept my comments. I'm like 80% sure this comment won't post either, so I may be wasting time here. Oh and I got noooo suggestions. So… hi. 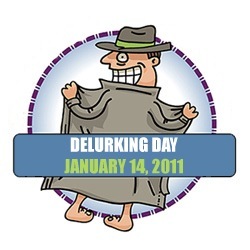 Hi, I'm a lurker who has now been forced to delurk and let me tell you, I do not relish taking off my invisibility cloak. Well, I read your blog because I from the bay area myself (so I could become a potential stalker) and also because I was fascinated to see a daddy on the Blog Her network. Blog prompts? How about a movie review? I can see you've shamed many a lurker here by putting up this post. Therefore, I believe I will steal this post idea, as well as your cute de-lurker picture, and put the same thing on my blog. I'm sincerely HOPING I have some lurkers, because if all the people who read my posts already comment….that means I only have about three readers. How about the difference between an African and a European Swallow? Twilight Series: Useless dreck or prize-winning material? Hmmm. I can't remember if I've left two or three comments in the last year. Shoot! Hi there! And you can write about… uh… daycare germs and their impeccable timing for when you actually have stuff to get done. One of them is in some kind of outside care, right? Or the end of teething for those of us with no light at the end of the tunnel. Geesh… you don't just want us to delurk but you also want blog prompts???? Can't you just put an ad over there in the sidebar? Right under the recent comments? I'm sure one would totally fit. Perhaps Rick Astley would be willing to buy some ad space. I lurk on occasion. Showing my blog face today. I would like you to write about the first concert you ever went to. You can also feel free to write about why I shouldn't end sentences in prepositions. You *do* know that you're spelling your son's name wrong, don't you? It's A-d-r-i-a-a-n, like my son's name. We all know that 'Adrian' is a town in Michigan, not a boy's name. Besides, 'Adrian' just looks funny. Please have his birth certificate changed to 'Adriaan' immediately. I am generously giving you 5 business days before I notify the authorities. Thank you for your cooperation. Hmmm, I would like you to justify your poor choice in hockey teams. I mean, I applaud you on not supporting the Leafs…but Detroit? I just threw up a little. I've been a devoted reader since before Adrian was conceived, but it has been ages since I commented. Here's why: I do most of my blog-reading in an iPhone app called "Byline." To comment, I need to open the post in Safari, and it takes FOREVER for the page to load, and even longer to type comments. I'd comment much more often if I could comment directly from the app, and swiftly. So, here's a prompt for you: Are there any blog-reading iPhone apps that enable you to comment quickly, directly from the app? And if there is more than one such app, which are the best and why? Because I really get a kick out of your product reviews… and because, why would I want to do this research myself when Backpacking Dad could do it for me? Though in truth, my favorite posts of yours are the ones when you talk about parenting. So if you decide not to use this (really boring) blog prompt, my feelings will not be hurt. Although… you wrote a coffee maker product review that was funny, so I think you could handle this.